Colleen is a visual, performing, and environmental artist, exhibiting internationally. She’s a TED Senior Fellow with a BA in Design from UCLA , and a post-baccalaureate degree in Metals from the Oregon College of Art and Craft. With 20 years of arts background, she moves from jewelry to steel sculptures, mixed-media interactive works to conceptual and collaborative projects. An armaturist for puppet fabrication, Colleen makes ball-and-socket skeletons for stop-motion animated puppets; she worked on the stop-motion animated feature, “Coraline,” (Feb. 2009). 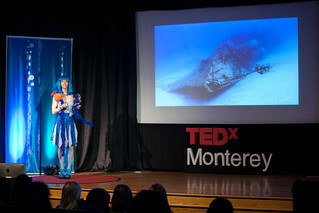 Her current creative focus is the ocean as she is developing Living Sea Sculptures using the Biorock mineral accretion process to help corals and biodiversity revive through art, science, and community. Her socio-ecological alter egos, Miss Snail Pail, a snail abatement specialist, and Amphitrite, goddess of the sea, engage environmental topics through conversation, films, and public interactivism, such as coral restoration re-enactments.